Project 2 is.getting people to sponsor a water cistern for the grandmothers. These grandmothers are raising 90 orphans. This is not micro about micro lending this is about supporting an economy of caring. Many grandmothers across Africa are raising orphans because the children’s parents are effected by AIDS. These 18 grandmothers have requested assistance with raising funds for them each to have a 5,000 gallon water cistern. Water is then collected off the tin roof. The cost of each water cistern is $480. That includes all the labor parts and equipment plus a little extra in case repair is needed. Currently the grandmothers must send the children to fetch the water. Usually girls are the one who must walk 1 1/2 miles to the watering hole and walk back with the pail on their head. Below is an actual grandmother standing in front of the water cistern and the second picture is the children carrying the water on their heads. 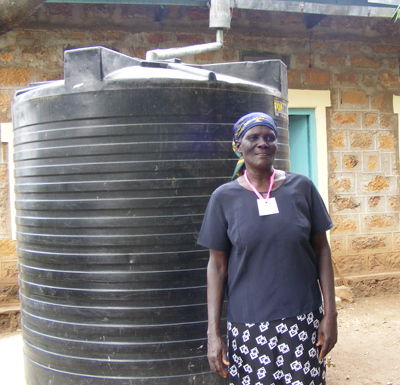 The St. Monica Grandmothers Group through your generous support have all received their water tanks. This GOAL was Accomplished!!! Project Completed!!! Thank You! See the thank you letters Mary forwarded in RECENT POSTS. We have been asked to raise the funds for 16 more water cisterns for the Marit Women’s Group of younger widows who are also raising approximately 74 orphans too. $480. US will buy one 5,000 water cistern.